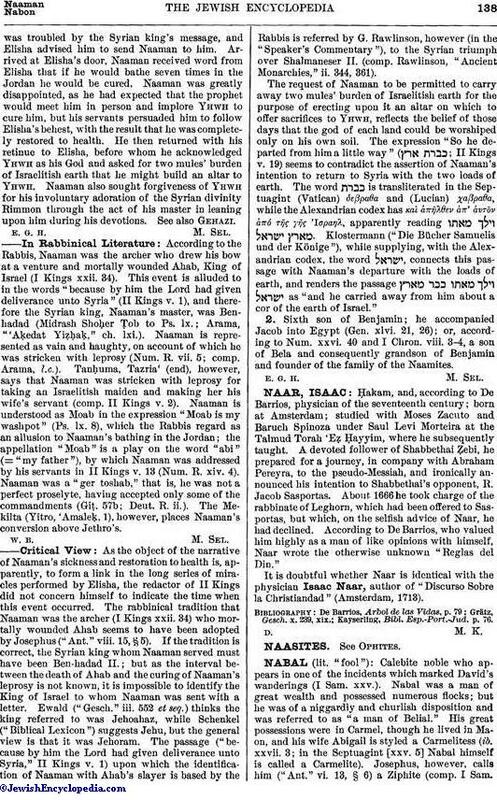 Ḥakam, and, according to De Barrios, physician of the seventeenth century; born at Amsterdam; studied with Moses Zacuto and Baruch Spinoza under Saul Levi Morteira at the Talmud Torah 'Eẓ Ḥayyim, where he subsequently taught. A devoted follower of Shabbethai Ẓebi, he prepared for a journey, in company with Abraham Pereyra, to the pseudo-Messiah, and ironically announced his intention to Shabbethai's opponent, R. Jacob Sasportas. About 1666 he took charge of the rabbinate of Leghorn, which had been offered to Sasportas, but which, on the selfish advice of Naar, he had declined. According to De Barrios, who valued him highly as a man of like opinions with himself, Naar wrote the otherwise unknown "Reglas del Din." It is doubtful whether Naar is identical with the physician Isaac Naar, author of "Discurso Sobre la Christiandad" (Amsterdam, 1713).